Rosa Schleife Brand have long history,with good quality and extreme customer experience! - Luxury Diamond design makes it as a perfect gift to yourself, friends, lovers and families,suit for any occasion. - Stainless steel cover protect your watch against scratches, drop, dust and water. *** Item color displayed in photos may be showing slightly different on your computer monitor since monitors are not calibrated same.Thank you for your understanding ! - Fast Reply within 24 hours - If you have any problems or is not satisfactory, please kindly contact us, we will response within 24 hours to solved and make you satisfied. - Shipping - We are provide good shipping,and the delivery time by 14-21 work days. ** Compatible with all 42mm Apple Watch series 1/ series 2/ series 3, Edition, Sport, Apple Watch Nike+. ** Precise hole cutouts make it easy access to all buttons. Lightweight and ultra-thin case fits smoothly on your iWatch,and beautiful your apple watch. ** Full protective cover design keeps your watch new by preventing the watch face and edges from drop, dust ,water,chipping and scratching. ** Very easy to use,like as no cover in your watch.and touchscreen interface Sensitive is good, no affecting on the screen responsiveness. 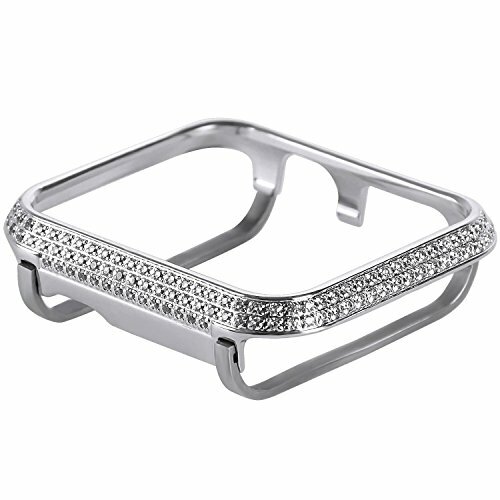 ** Luxury Diamond and stainless steel design makes it as a perfect gift to yourself, friends, lovers and families. Plsae note: Watch Case Only, the Watch in NOT Included ! If you have any questions about this product by Rosa Schleife, contact us by completing and submitting the form below. If you are looking for a specif part number, please include it with your message.